Seafood is something we crave for, something we always look forward to as we don't normally get good quality fresh seafood around here in Delhi. We do get our quota of seafood when we visit INA market and stock the fridge but that doesn't happen very frequently because of the hassle of cleaning the seafood at home. It is much more easier to order chicken or meat and start cooking immediately without any hassle of cleaning. Yes, sometimes I compromise on cooking some of my favourite foods because of cooking and cleaning hassles and prefer eating out whenever we get a chance. 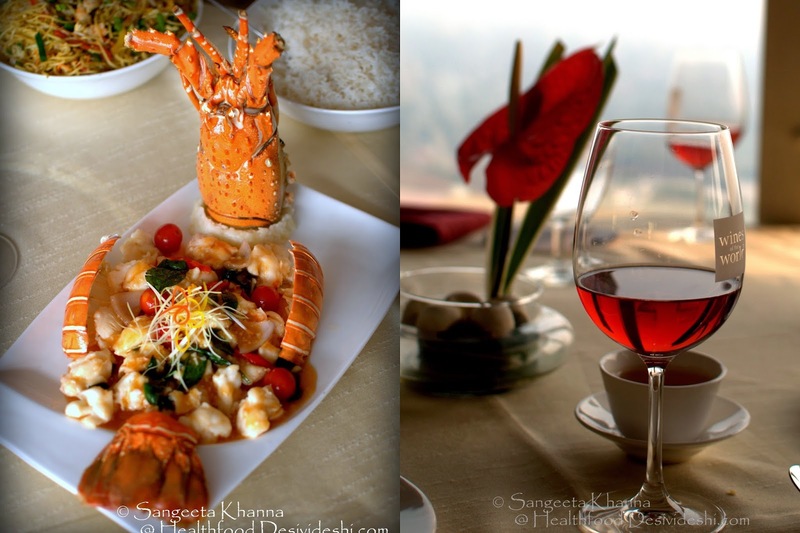 And we have always loved the seafood served at Le Belvedere (at Le Meridien, New Delhi) with a nice view of Lutyen's Delhi. 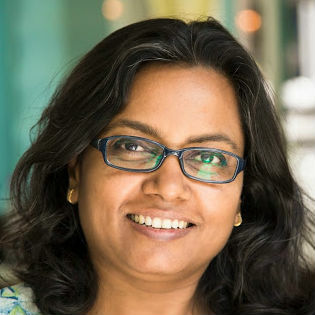 It was a coincidence that Purba asked on Twitter whether we can meet any time soon and I suggested why don't we meet at Le Belvedere. It was the occasion of a preview of the soon to be held seafood promotion at the restaurant and we lapped up the opportunity. Love for seafood and joy of meeting friends after a while both being nurtured together. It was a fun lunch with sips of wine and laughter. I started with a clear chicken soup that is one of my favourites even at home. Simple flavours with fresh crisp vegetables and generous chunks of chicken breast that comfort the soul. I started my soup late and the main course had arived by that time and the soup was so good I kept having in between my main course bites. Pomfret in hot bean sauce was very delicately flavoured, soft and fresh but many of us found the bones a little distracting. 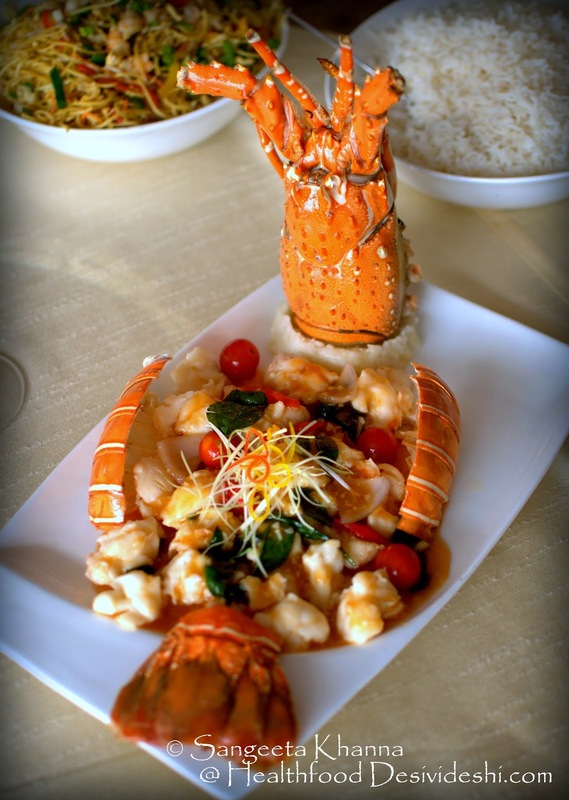 I have always loved their lobster and this time too it was the same old good taste with fresh ingredients and flavourful sauce to accompany. Perfectly cooked and lightly seasoned I must add. The whole red snapper looked sad in the face but packed a punch taste wise. We tasted the king fish in black pepper sauce and that was good too. But the unanimously favourite dish was the king scallop in chilly bean sauce. 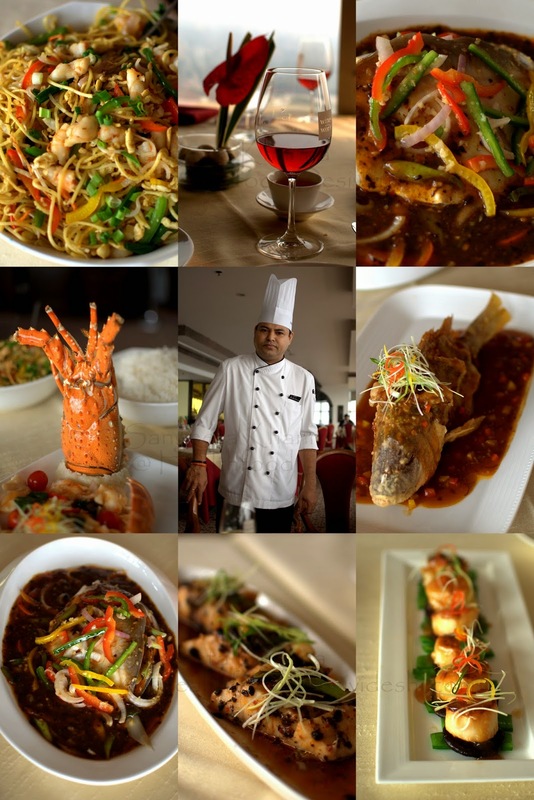 Chef Balkishan Chauhan was generous enough to part with the recipe for all of you. Perfect texture that results from great timing while cooking and fresh crunchy vegetables to pair it with. Loved the black mushrooms as a base and crisp snow peas. Here is the recipe for you all. All this seafood was polished off with stir fry noodles, plain boiled rice and sticky rice. My choice is sticky rice for sure. 1. Take king scallops and wash them properly. Keep aside in cool place. 2. Wash and cut bell peppers, onion and spring onion into dices. 3. Marinate scallops in a mixing bowl with salt, white pepper, egg, and corn flour. 4. Keep marinated scallops in refrigerator for ½ hr. 5. In a wok heat the oil, add marinated scallops and cook it until golden brown in colour or tender. Keep aside. 6. Heat oil in a wok, add chopped ginger, garlic, black bean and sauté it. Add bell pepper, onion, and spring onion toss it well. 7. Add chilly paste, soy sauce dark, fish stock, salt, and sugar in to the mixture and bring it to boil. 9. Add Chinese cooking wine and sesame oil and mix it. 10. Remove from heat. Serve hot. 11. It can be served with sticky rice or noodle. 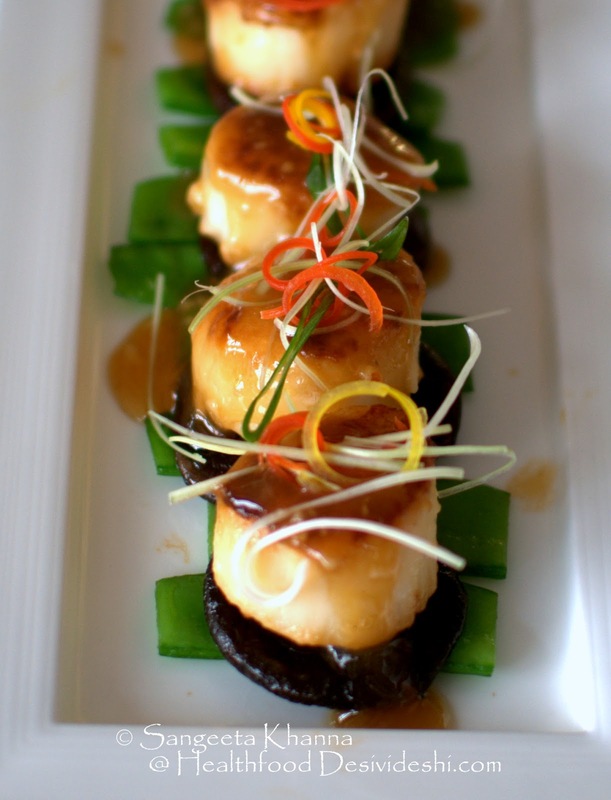 Try the recipe at home and recreate the magic that Chef Balkishan creates with king scallops. 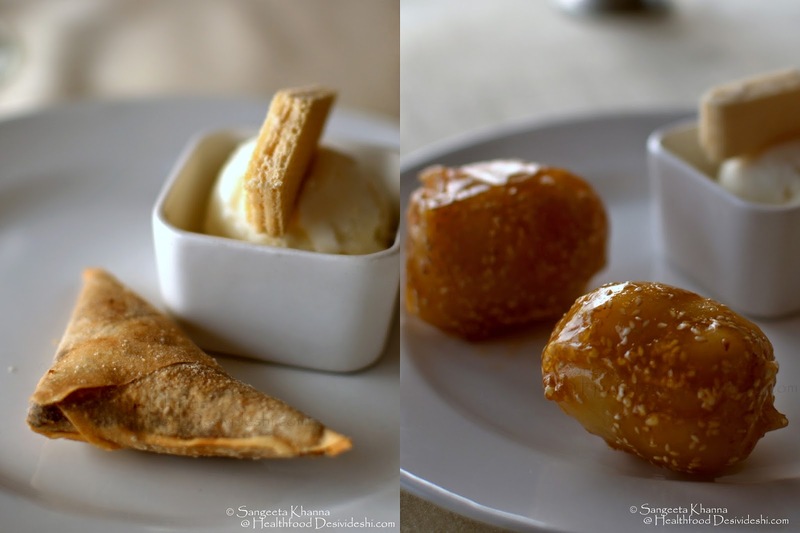 Desserts were not needed but Anasuya and Chef Balkishan insisted and we tried the date pancakes and toffee banana. I took a bite of date pancake it was well made, rich flavours. Toffee banana was praised by those who tried it. 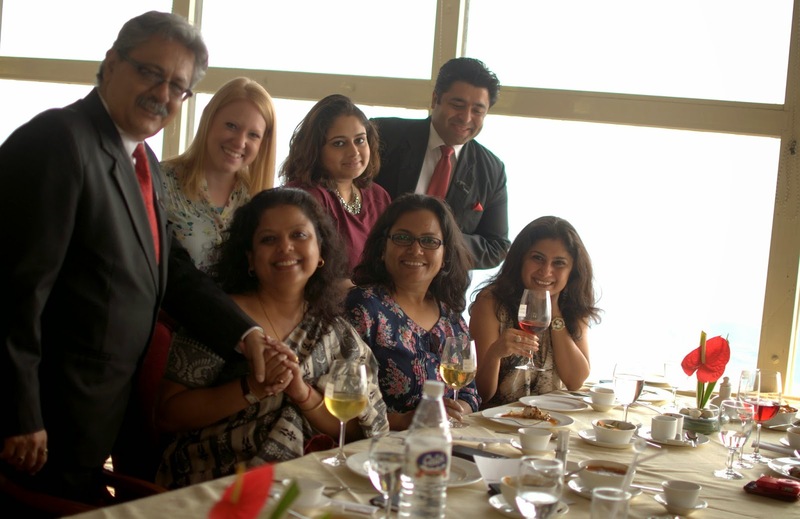 Here are the crazy bunch of people who spent a lovely time together that afternoon. Sipping illy coffee after the lunch and catching up on gossip. The seafood promotion starts from 14th of this month. You might like to go and experience the view from 20th floor and the yummy seafood too.